adventures of an almost 40 year old intern...: intern takes a trip: beautiful bhutan! so, my visit to bhutan was fascinating. lots of friends asked me "where???" after i told them i was traveling to bhutan after nepal. well, i happen to be a big fan of the today show (matt lauer makes me swoon a bit and kathie lee and hoda are my guilty pleasure...) and matt visited bhutan in 2007 during his "where in the world?" series and it looked pretty cool. i'm always interested in traveling to places that haven't been invaded by the western world and there is not a starbucks or mcdonalds in sight (even in cairo, egypt there is a kfc approx 100 yards from the sphinx, which totally bummed me out!)... anyhow, bhutan seemed like one of those untouched places so i added it to my mental must do list. well bhutan isn't a place where you can just show up and travel around on your own. you must book a tour with an official government approved company just to get a visa allowing you to enter the country. there is only one airline (with a whopping 2 planes in its fleet) that flies there and they offer a few weekly flights from kathmandu (and 3 other cities in asia). and take note, if you are flying from kathmandu you will have a great view of mt. everest on the way (be sure to sit on the left side of the plane)! yep, no need to have booked a mountain flight. you get a bigger window and better view when traveling to bhutan. who knew? upon my arrival in bhutan i was enamored by the beautiful scenery, blue skies, mountains, views of the himalayas (oh, yeah!) and unbelievably bright blue rivers (because of mountain glaciers melting into them). i indulged in my obsession of taking photos of monks and buddhist prayer flags every single day i was there. most of the landmarks to visit in bhutan are dzongs (buddhist monasteries). it was refreshing to be in such a clean aired environment after the hustle and bustle of kathmandu. so, the food in bhutan was not my favorite. unbeknownst to me when i booked my trip, every single meal was already chosen and made for me before i arrived at any given restaurant, hotel, etc. so the american (i want what i want, when i want it) in me was disapointed to not have a menu to order from. that compounded with my first meal experience in bhutan raising a red alert in my inner germaphobe made my meals slightly less enjoyable... here's how my conversation with my guide at that first bhutanese lunch went: i'm in a restaurant, enough food to serve a family of 6 is placed in front of me. i explain to my guide, bhim, that i realize i'm american but contrary to our reputation of being big eaters there no way i can possibly eat everything that has been placed in front of me. well, bhim quickly explained "oh, don't worry, nothing will go to waste. whatever you don't eat will be reheated and served to the next guest." i don't know if he recognized the look of horror on my face in response to that statement. i quickly checked the time and wondered how many times this meal had been breathed on, touched by others, and then reheated and offered to other folks before finally making its way to me. after all, i am the gal that doesn't love eating from a u.s. restaurant with a sneeze guard.... and this food wasn't even "protected" by plexiglass or on a buffet table. needless to say i was thankful that i still had some zone bars left over from the nepal part of my trip. Also, i continued my vacation vegetarianism during this part of my journey... meat is all imported into bhutan from india. this is because it is a buddhist country and it is illegal to slaughter animals there. interesting that their beliefs do not allow them to slaughter food yet they are perfectly ok with importing food that was killed in other countries. hmmm... and very hot chilies are used as a vegetable rather than a spice. pretty much all of the buildings in bhutan (dzongs and homes) are built to look like traditional bhutanese buildings (white exterior with carved wood windows and doors with beautiful painted trim). so it is a little tough to discern the old from the new. the government there is very interested in preserving and protecting their culture and this is one of the ways they do so. there is one little decorating element that they use on the exterior of their homes that i don't really see myself copying in the future. ya see, they are a big fan of painting very (and i mean very!) lifelike images of a certain male body part on their homes. i don't really consider myself a prude but when i realized what they were i was a little shocked that they painted so many and so many large ones, and with so much detail, on their buildings. when bhim noticed the wide eyed and open mouthed expression i was staring at them with he explained that it is very common to paint them (and also install wooden replicas over doorways) on homes in order to ward off evil as well as promote fertility. since my blog isn't of the x-rated variety, i am not posting a photo of this artwork... instead, i will let you do your own little google image search using the word bhutan and the p-word and see what comes up. and then you will see... yep, that's what i saw too. wild, huh? oh and the love of that male body part extended into the temples as well. while visiting a temple, bhim asked me if i would like to be blessed by the head monk there. i said "of course!" like most folks, i could always use an extra blessing or two! so, anyhow, this monk takes a very large wooden you-know-what and has me bend over and rubs it on my head while chanting something. my guide, bhim, then exclaimed "holly, you are now fertile!!" what???? i replied "um, can i have a do-over? i would prefer a cute boyfriend blessing instead.... or new career success blessing... or something else... fertile??? not so much...."
the official sport in bhutan is archery. i had never seen an archery match before anywhere before this trip. well, luckily during one day of sightseeing, bhim and i happened upon an archery match. it was really cool to see! i have no idea how these guys could see the target, it seemed like it was a mile away! and every time one of them would hit the target the rest of his team would sing and do a little victory dance. oh, and i haven't mentioned one of my favorite parts of bhutan. you may have noticed from my photos... they have an official outfit. yep, the men wear this short bathrobe looking costume called a go and the women wear a longer skirt with a jacket called a kira. western clothes are allowed as long as they aren't doing anything official (like working or visiting a bhutanese monument or monestary). oh, and like every great sport, they had cheerleaders! gals singing and dancing in traditional bhutanese style. complete with a band! people have asked if i enjoy traveling alone or wouldn't i rather traveling with someone. well, yep i would love to have someone awesome to travel with. the bummer is not so many of my friends are interested in traveling to the places i want to see so my choice is often travel alone or don't travel. normally it's not a big deal to be alone because somehow i always end up meeting interesting people while abroad. well, bhutan was a little different. because of the strict government control on visitors you aren't really ever alone and without your guide. that makes it a bit tricky to get out there and meet people. but i am happy to say i did meet someone cool to hang out with during this trip! i was surfing my ipad in the hotel bar (the only place to access the wi-fi at my hotel) and started chatting with this really cute guy. turns out he is a pilot from south africa (what is it with me meeting so many cool people from south africa on this trip???) and is on assignment working for a start up airline in bhutan. anyhow, after spending hours chatting and sharing our experiences in bhutan i invited him to join my guide and me the next day on what was supposed to be an amazing trek to a beautiful dzong on a cliff called "tiger's nest." beautiful waterfall in the rocks and a rainbow! my indiana jones style trekking companion! oh, and my favorite type of photo to take when there is beautiful scenery is one where i am jumping in the air with a great backdrop. well, we bonded with a fun couple from hong kong during an impromptu jumping photo shoot on the hike and i guess you could say they jumped right into the idea. how awesome is this photo??? so that day ended with mr. south africa taking me to dinner at a local restaurant... yep, i was asked out by a cute guy even with the worst hair of my life and a bad outfit i wouldn't wear in my normal l.a. existence (one of 3 outfits that had been rotated for the last 3 1/2 weeks)... oh, and bonus was that i was taken to a restaurant where i could actually order my own food! and it was made fresh just for me! yay! best meal ever in bhutan and the gal that owned the restaurant was awesome and we spent a bit of time chatting with her. turns out she is indian and met her bhutanese husband while working as a nurse in a hospital in india. his father was her patient and she traveled to bhutan to be with him. so romantic i loved it! most bhutanese and indian marriages are arranged and i love that hers was a love story.... so, if you are ever in paro, bhutan you must eat here. look for the bright yellow staircase off the main drag and that will lead you to the best food in paro! it's called the sonam trophel restaurant. oh and the owner has some photos of herself with demi moore and matt dillon who both visited many years back. of course this intern gal had to have one taken too. you never know, i may just end up some famous hgtv designer deserving of a place on her wall of fame... i'm just sayin', you gotta put it out there right??? the stairway to bhutanese food heaven! and he was a great sport for joining in! of course my time in bhutan had to end with a jumping photo. my guide, bhim, didn't really want to do it but i begged him to join in and when he saw the results he was a little tickled. oh an before i forget, while in bhutan, i encountered these women weaving the most intricate beautiful cloth! the bhutanese are known for their amazing woven textiles and i can see why! i returned to kathmandu christmas eve and had a lovely dinner with my new young australian friend and then christmas morning breakfast before my very long journey home. we met this fabulous 77 year old woman from india who joined us. she had the greatest personality and the most positive energy anyone would be drawn to. she shared with us her words of wisdom - stay positive and good things will happen to you. i have to say, she's right and those are definitely words to live by whether you are 17, 40 or 77 (our ages). and a great thought to keep with me as i enter into 2012. oh, and if you are in kathmandu i highly recommend you stay at the hotel courtyard. that's where i met these gals! i found it online and picked it because of all of the stellar reviews it received on trip advisor. and i have to say they were right. it was the best hotel of my trip and the owners, michelle and pujan (or punjab, as i kept accidentally calling him because of my love of the movie annie), are awesome and create a really homey atmosphere tucked away from the hustle and bustle of kathmandu. i highly recommend room 308.
my journey home felt daunting since it was 3 long flights with long waits in between before arriving in la... but, it began with monks on my first flight. yay! orange ones no less! 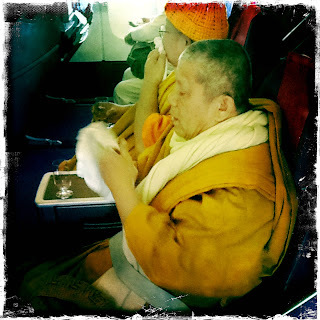 monks on a plane! how cool is that??? Monks on a plane! You should see if Samuel L. Jackson is available for that movie! ha! And the Punjab reference had me crying! As did thinking of Dad reading about your fertility ceremony! Happy you are back in the 'ol USofA! What a fantastic trip! Holly - I just about bust a gut laughing at the strip join scenario! That is truly wonderful and awesome. I am very very happy that you made it home safely with awesome stories to boot!